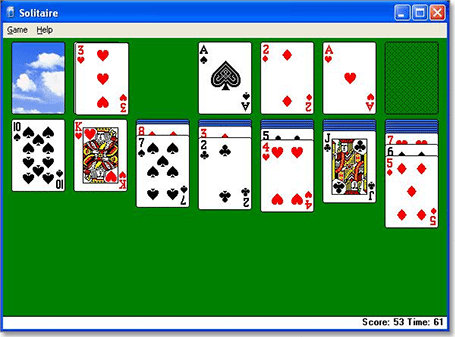 Most card players are familiar with the rules of solitaire, whether you’ve played with a real deck of cards or by using the popular Windows computer game. There are also many variations of solitaire, following a similar structure but with additional spins on the rules or game play format. One of the most popular variants is Las Vegas Solitaire, which is very easy to follow if you’re already familiar with classic solitaire. Vegas Solitaire is a single player game and uses a standard deck of 52 playing cards. The strategy is the same as standard solitaire. The main difference in Vegas Solitaire is unlike the original version where cards are turned up three at a time from the stock pile and reused indefinitely, Vegas Solitaire cards are turned up one at a time and the stock pile can be gone through once only. The aim is to get as many cards into your foundation piles during this time as possible. To start the game, shuffle the deck of cards and distribute them into a single row of seven piles. The pile on the furthest right hand side will be made up of seven cards, the next one six cards, then five cards, etc. Turn the top card on each stack to face up, while leaving all the others facing down. All remaining cards are then stacked up face down and become your stock pile. The aim is to then create four ‘foundation piles’, one for each suit. Foundation piles can only be created with the appearance of an Ace, and must then be built upon in ascending order from Ace to King. For example, a foundation pile can be started with the appearance of an Ace of Hearts, then when a Two of Hearts appears, you can move it to the Ace, followed by a Three of Hearts, etc. Within your seven stacks, you can move cards around between piles only if they rank lower and follow a different suit colour. For example if one of the face up cards is a black Jack of Clubs, and a face up card on another pile is a red 10 of Diamonds, you can move the Ten card to the Jack, facing up. You can then turn the top face down card on the other stack to face up. Kings can be moved to start a new pile but only if one of the seven original stacks has been completely cleared. There cannot be more than seven stacks in play at once. If you can’t make a move from any of the face up cards to the foundation piles, you can turn to the stock pile, turning the top card to face up and then moving it between the seven stacks or the foundations. You can only go through the stock pile once; unlike classic solitaire it can’t be reshuffled and reused. The game is over when there are no possible moves left. Your success is based on how many cards you were able to move to the foundation piles. When playing for real money, a jackpot is awarded if a player is able to successfully finish the entire game, stacking all 52 cards into ascending rank order by suit. Can I Play Vegas Solitaire Online? Vegas Solitaire is a popular card game and can be found online at various free play gaming websites. It’s unlikely you’ll find this game at any of our recommended online casinos, but you can play Vegas Solitaire for free on your desktop, laptop, mobile or tablet using Google Play or by downloading it from the iOS App Store. Facebook users can play Vegas Solitaire through Facebook Games and you’ll also find it at various instant-play solitaire gaming sites. Can I play Online for Real Money? While Vegas Solitaire, and other Solitaire variations for that matter, can’t typically be played online for real money at our recommended casinos, there are many other fantastic card games available at these online casinos for real cash wagers. Aussie punters can play such card games online as blackjack, baccarat, craps, Casino Hold’em Poker, Texas Hold’em Poker, Caribbean Stud Poker, Pai Gow, Pontoon and more. Bets can be made in AUD using a range of secure payment methods including POLi, Visa, MasterCard, Neteller, Skrill, Ukash and direct bank deposits. Some land based gambling venues offer Vegas Solitaire for real money bets, where games can be hosted by a dealer and winnings are paid based on the amount of cards you’ve managed to place in your foundation piles. This method of payment has the chance to be pretty lucrative, but requires equal parts player skill and luck of the draw of the cards. As of September 2017, online casinos are legally off-limits to Australians. International players can still play card games online but we recommend considering multiple factors before choosing a site including game variety, player security, loading speed, banking options and customer service standards.